Formerly known as Puzzled Inc., CoTa Global recently rebranded earlier this year which resulted in immense success. 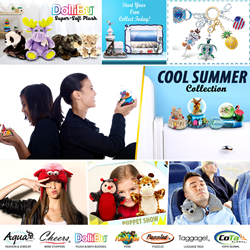 What initially started as a small 3D puzzle manufacturer in 2004, has grown to be the preferred supplier in the souvenir and giftware industry offering several product lines, unique designs, a free name drop service to customize items, and competitive pricing. The company, which prides itself on crafting unique one-of-a-kind items, caters to both small and large retailers, museums, theme parks, the hospitality industry and the online market. Earlier this year, they introduced a brand new interactive website offering a brand new shopping experience including easier shopping, faster load times, streamlined categories for easier and quicker access to favorite products, as well as a virtual flipping catalog. Some of their collections include: Aqua Jewelry offers stunning nautical and nature-inspired pieces ranging from earrings, necklaces, rings, and more. These fine and unique pieces are all crafted from Zink and Pāua Shell from New Zealand. There is no other shell in the world that has it's vibrant color variation of paua. Each shell has a different color range, making each piece unique and special. Cheers offers beautiful and unique selection of high quality and affordable wine products that will delight you with wine country charm including metal and glass wine stoppers, metal wine charms, and wine bottle openers. Collections range in a large selection of themes, colors, and designs. Each piece is modern and practical and designed to last. Dollibu offers a large selection of high quality and affordable plush products including children's bags, hats, notebooks, pens, magnets, keychains, and stuffed animals. Each piece is made with high quality thick and super soft plush fabric fur. Planet Pens offer a large selection of high quality and affordable designer ball point pens. Each pen is molded from high quality cold cast resin and hand painted with extreme detail for added impact. Collections feature countless of one-of-a-kind designs and themes. Taggage! offers a large selection of high quality and affordable designer luggage tags. Each tag is made of high quality rubber molded in unique 3D designs and featuring vibrant colors for easy identification at airports. Each luggage tag includes an identification card to fill out with your name and contact information. Collections range in a large selection of themes, colors, and designs. These decorative tags are great for all luggage types including golf bags, sports bags, and back packs. To learn more about CoTa Global contact them at 818.991.9245, or email customerservice(at)cotaglobal.com, or visit their website at http://www.cotaglobal.com.